Although you could ascend fixed climbing ropes on slings attached with prusik knots, mechanical ascenders are both safer and more efficient (fig. 11-28). Attach an etrier and a daisy chain to each ascender. The etriers give you a platform to stand on, and the daisy chains positively connect the ascenders to your harness. Use a cara-biner—not a fifi hook—to clip each daisy chain to an ascender. To expedite the process of preparing your ascenders, mark the loops in both the daisies and etriers where the gear is properly adjusted for length while jugging. You do not untie from the end of the climbing rope while ascending. Remaining tied in serves as a backup in case both ascenders fail. To further decrease the likelihood of a long fall, you should periodically "tie in short." Tying in short is an easy precaution that has saved lives. As the second ascends, an ever-lengthening loop of climbing rope forms below him, making for a long fall if the ascenders fail. To avoid this danger, stop periodically and, using the climbing rope just below the ascenders, tie a fig-ure-8 loop and clip the loop into your harness with a locking carabiner. This guarantees a much shorter fall. Repeat this procedure about every 20 feet. Each time, unclip and untie the last figure-8 loop after the new figure-8 loop is clipped into your harness. Even when tying in short, do not untie from the end of the rope. 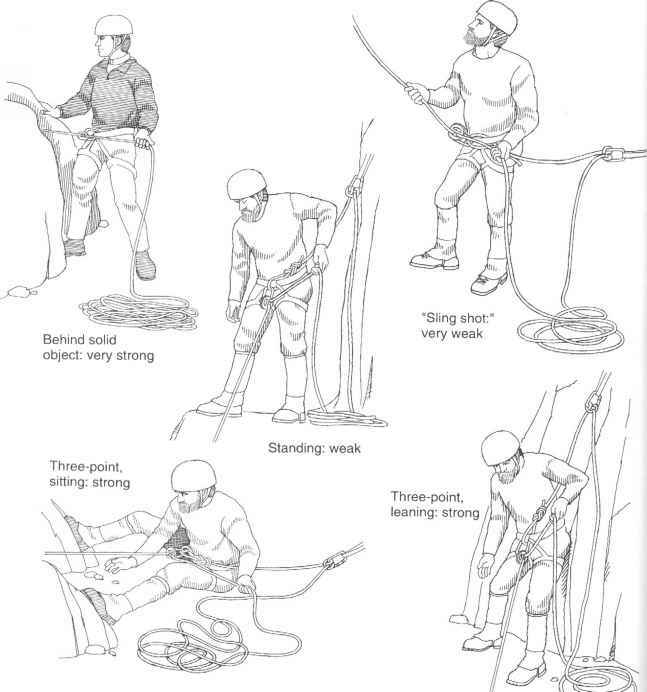 Often while jugging, it is necessary to remove the upper ascender from the rope and place it above a piece from which the rope cannot be undipped while weighted from below. This same situation arises when the rope runs over an edge. Before removing the ascender, tie in short; this is a convenient time to do so. Fig. 11-28. Use of ascenders; note daisy chains from each ascender to harness, and climber tied in short. piece, check that the cam trigger is fully locked or the ascender could pop off the rope. This is especially true if you are jugging on a diagonal rope because the ascender has a tendency to twist to a vertical position once weighted. This twisting can be minimized by clipping a carabiner between the ascender and the rope as well (fig. 11-6). Once the upper ascender is reattached and your weight is on it, you will be able to unclip the rope from the problem piece of aid. Other precautions should also be taken while ascending. First, carry a spare prusik sling just in case an ascender fails. And, as in all climbing, beware of sharp edges. Jugging places the rope under tension and sharp edges can damage it. Ascend as smoothly as possible to minimize the sawing motion of the rope running over an edge. How to remove an ascender from rope? How to clip into your ascenders? How to connect an ascender to a harness? How to unclip an ascender from the rope? How to use a mechanical ascender mountaineering? How to use a climbing ascender? How to connect climbing ascenders?